What a wonderful invention. 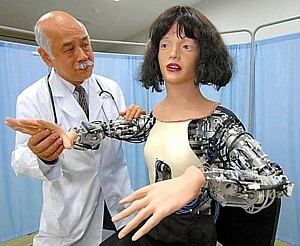 I agree that this robot would be very useful in helping students with their practice. Hopefully, the researchers can make other robots for the purpose of training other students in different fields. That's fascinating - I must ry and track down some video of 'her' in motion but even in the static image above there is certainly something very unsettling in the way that her mouth is distorted and held in that grimace. Presumably a programmed response to indicate pain to whatever illness the doctor is attempting to elicit. One of the theories that I m looking at as part of my research is that there's a link between the UV effect and the disgust/aversion response that hereditary deformities can cause. In this instance, the effect may be boosted by the robot playing sick - so if the UV effect and the aversion are linked, this might either make the UV effect stronger, or if they're separate reactions, it may tip the response out of the 'creepy' UV category and into the more familiar disgust/aversion reaction. Thanks for the post, there's a lot for me to think about here!